iPhone 3G S users and iPhone 3G users who install iPhone Software 3.0 when it's released on June 17th, and who also subscribe to MobileMe, will be able to use the "Find my iPhone" feature of the internet service to help locate their iPhone if its been misplaced, lost, or stolen. The process begins by logging into me.com to view a map that shows the approximate location of the misplaced iPhone, assuming it's turned on and and can locate a GPS signal. 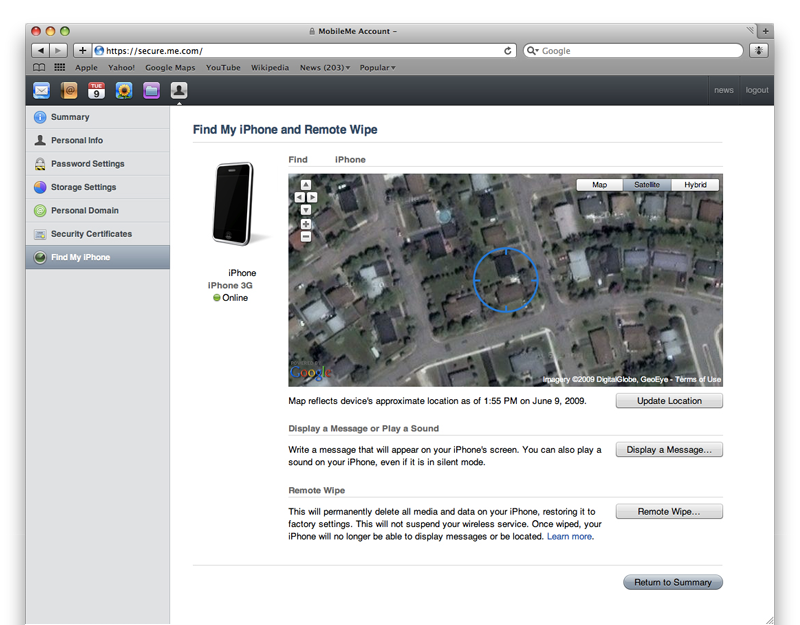 It its nearby, users can force the iPhone to play a sound through the MobileMe web interface to help them locate it. 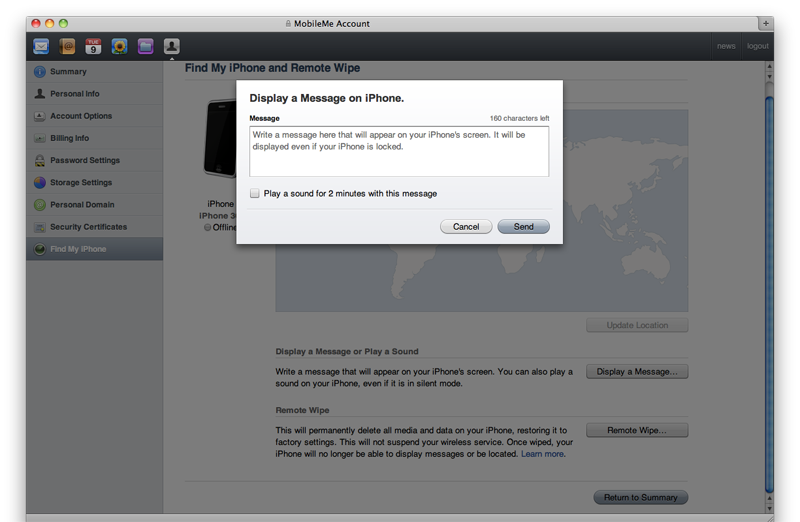 Alternatively, MobileMe can also display a message on the Home screen of the iPhone with instructions on how to return it to the owner in the event that it's been found by someone else. Apple overnight enabled Find my iPhone for developers currently testing iPhone Software 3.0 beta. Thus far, reactions have been mixed, with one person familiar with the software saying it "works great," while another said his iPhone wasn't detected by the service. 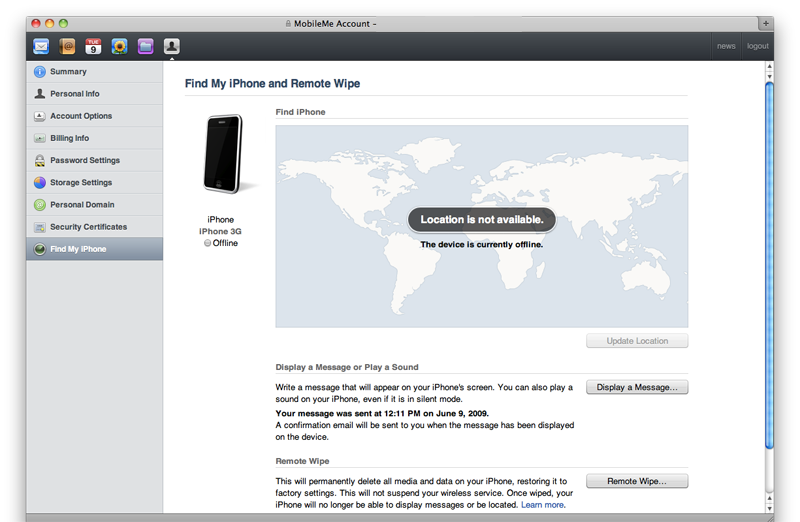 The first screen capture below shows the MobileMe interface for Find my iPhone when an iPhone is deemed to be offline or out of GPS range. The second shows an iPhone 3G that has been successfully located with pinpoint precision on a Google-supplied satellite map. Illustrated map and hybrid views are also available. The third screenshot shows the interface for sending a custom message to the iPhone's Home Screen. Remote Wipe is another feature for MobileMe-equiped iPhone users slated to turn up with the release of iPhone Software 3.0, one which was similarly thrust into live testing overnight. Users who lose their iPhone and are unsuccessful in having it returned to them after displaying a custom Home Screen message can initiate a remote wipe and restore factory settings. 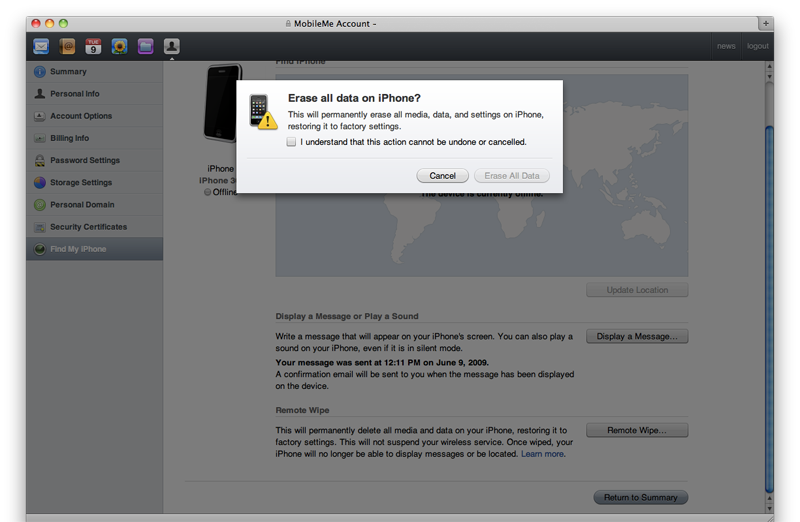 If the iPhone is eventually recovered, users can restore their data by enabling their MobileMe account on the iPhone. Also arriving for MobileMe users with iPhone Software 3.0 will be a free iDisk app that lets them view files on their iDisk right on their iPhone. Microsoft Office or iWork 09 documents, PDFs, video files, and more are viewable in landscape or portrait, Apple says. Users will also be able to access Public folders of other MobileMe members with a few taps. The same app, which will be free on the App Store, will also let users share files that are too big to email. Users simply need to choose their recipients and iDisk will send out an email with a link to download the files. A year-long subscription to MobileMe costs $99 after a free trial. 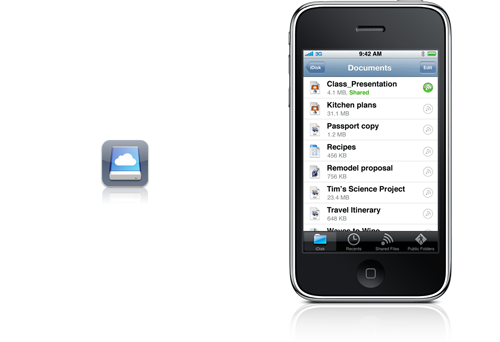 For more on the cloud-based internet service, see AppleInsider's six-part series Inside MobileMe.